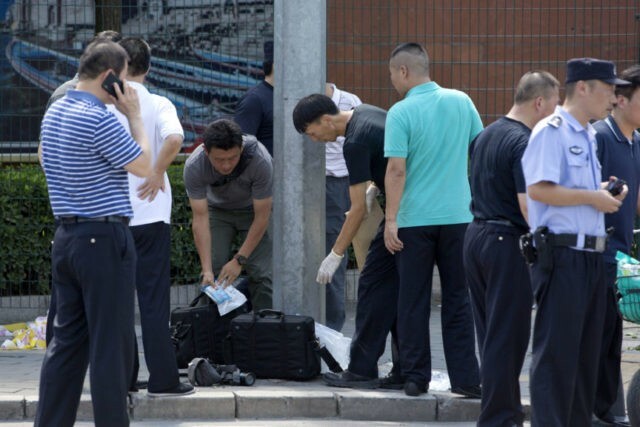 An explosive device was detonated outside the U.S. embassy in Beijing on Thursday. The suspect arrested by Chinese police, described as a 26-year-old man from the Inner Mongolia region, was the only person injured. In a possibly related incident, a woman was taken into custody for attempting to set herself on fire near the embassy. “I’d just arrived and started to queue and then heard a loud explosion about 100 meters away,” a 19-year-old high school student who gave his name as Li told reporters. Li said the blast happened shortly after 1 p.m. as he queued to apply for a U.S. visa to take an exam in Los Angeles. A police SUV appeared to have been damaged, with its back windshield missing, and was cordoned off by police before being removed, a Reuters witness said. Li Shaohui, a 58-year-old sanitation worker, said he felt the ground shake and that some people screamed. “I thought first there was big a car crash,” Li told Reuters, adding that the smoke had cleared quickly. The Financial Express of India said the man was trying to throw his explosive device over the embassy fence when it detonated prematurely and injured his hand. Given the state of affairs in China at the moment, she might have been referring to the Chinese pharmaceutical companies under fire for distributing substandard vaccines to children. If the account of the bomber’s motives cited by the New York Times is accurate, and the two incidents were related, it sounds like they were trying to get the American embassy’s attention to protest goings-on in China. That would go a long way towards explaining how the Chinese authorities are handling the case. The NYT noted that China has a history of frustrated citizens resorting to violence when the government ignores their petitions for grievance.